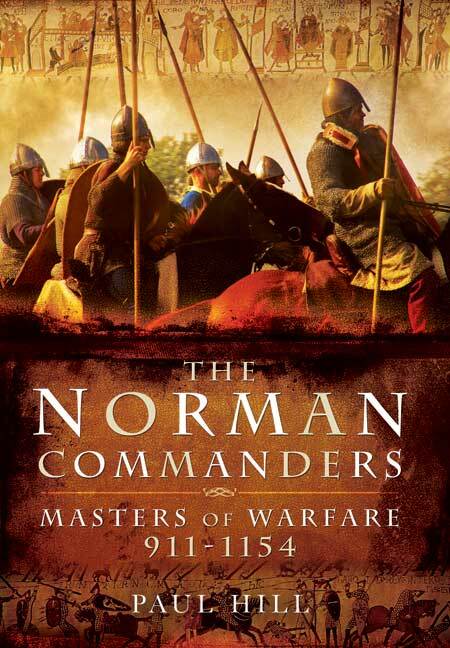 You'll be £25.00 closer to your next £10.00 credit when you purchase The Norman Commanders. What's this? Robert Guiscard, William the Conqueror, Roger I of Sicily and Bohemond Prince of Antioch are just four of the exceptional Norman commanders who not only led their armies to victory in battle but also, through military force, created their own kingdoms in the eleventh and twelfth centuries. Their single-minded and aggressive leadership, and the organization, discipline and fighting qualities of their armies, marked them out from their Viking forebears and from many of the armed forces that stood against them. Their brilliant careers, and those of Robert Curthose, William Rufus, Richard I of Capua and Henry I of England, are the subject of Paul Hill's latest study of medieval warfare. In a narrative packed with detail and insight, and with a wide-ranging understanding of the fighting methods and military ethos of the period, he traces the course of their conquests, focusing on them as individual commanders and on their achievements on the battlefield. The military context of their campaigns, and the conditions of warfare in France and England, in southern Italy and Sicily, and in the Near East, are vividly described, as are their decisive operations and sieges – among them Hastings, Brémule, Tinchebrai, Civitate, Misilmeri, Dyrrhachium and the Siege of Antioch. There is no doubt that the Normans' success in war depended upon the leadership qualities and military capabilities of the commanders as well as the special strengths of the armies they led. Paul Hill's accessible and authoritative account offers a fascinating portrait of these masters of warfare. ... Hill's work is an excellent overview of the Normans, their commanders and the warfare they practised across the medieval world. This brilliant book with a brilliant cast of participants follows the men of extraordinary ability and courage, who created and ruled their kingdoms with a mixture of cruelty and magnanimity. From their campaigns to their battles, its remaining secrets are revealed. After examining the rise of the Normans in this his latest period book, the author discusses the lives of eight different Norman Commanders. This section followed by a look at 11 battles and campaigns they variously conducted and then by an extensive analysis of the Norman way of war. This includes the Normans and their horses, logistics and supply, training, leadership and discipline, strategy - the role of castles and their garrisons, the nature of sieges, ravaging and harrying, using the landscape - the list goes on. The extensive text is rounded off with the author's conclusion, a bibliography and an index. There are numerous illustrations - 30 photos in monochrome, 20 more in colour, 16 figures and 16 maps, plus a table showing the probable combatants at Hastings. This is a perhaps surprisingly absorbing book, with the author dispensing a great deal of information in a reliable but most readable manner. Highly recommended as an insight into aspects of early medieval warfare. Ask any person in the street to name a Norman commander (notwithstanding Norman Schwarzkopf the American Gulf War Commander!) and most will reply – William the Conqueror. His son, William ‘Rufus’ II is rarely remembered and his antecedents almost totally unacknowledged. In one volume Paul Hill gives us an accessible and scholarly history of the battle hardened Dukes of Normandy from their foundation by the Scandinavian born adventurer Rollo (the Northman/Normandy) to the creation and expansion of their seat of power in Normandy and their ultimate conquest of England. Commanders covered in detail include Robert Guiscard, Richard I (Count of Aversa), Roger I (Count of Sicily), William II and Henry I of England, Robert II Curthose (Duke of Normandy) and Bohemond (Prince of Antioch) as well as the ubiquitous William the Conqueror. After the first 100 pages we are by now well aware as to who was who and the author launches into the battles undertaken by these charismatic leaders. Hastings (of course) is included alongside others including Tinchebrai, Alencon, Bremule and others, some of which I had never heard of. A gap in my knowledge now more than fully assimilated due to this book. The final section of the book details the nature of the warfare undertaken by the Norman’s, recruitment, logistics, supply, training, discipline, castles, sieges and tactics. A final section has details on light and heavy artillery, archers and crossbowmen. This book deals with a subject matter I have never before seen brought into one volume and fills what I consider to be a void in the market and on the shelves of any Medieval history scholar, be they amateur or academic. The way the chapters are split means it is an excellent source of reference as well as an absorbing investigation of the time period involved (911-1135). The author displays his detailed knowledge and passion for the era on every page and has created a work which will entertain and inform all those with an interest in the origins and creation of the Dukedom of Normandy and their subsequent rule as mighty Kings of England.